Every part of a sentence is important. If a word doesn’t add value, you can remove it. That’s a valuable lesson that PayPerContent writers learn and apply to their writing styles. However, here are some parts of the sentence that simply cannot be removed. Even if they look simple. magine a life without prepositions. Those short words–in, on, at, of–may not seem like much, but they actually help you to better understand the essence of a sentence. Without these prepositions, you won’t know whether someone left your watch on the refrigerator or in the refrigerator. As you can see, using the wrong preposition changes the sentence completely. Prepositions can be especially difficult for non-native speakers of English but it’s common for native English speakers to mix up their prepositions as well. In this post, we’re going to try to make it easier to understand some of the more confusing preposition grammar rules. Prepositions connect nouns, pronouns, or noun phrases to other parts of the sentence, which sounds easy enough. It also sounds uncomplicated when you think about prepositions showing time, direction, location, or the introduction of an object. Before you use English to describe scenes, establish the positioning of the object. This is crucial when choosing which preposition to use. Grammarbook.com also reminds us that we shouldn’t use any additional prepositions if the sentence is clear without them. The egg is on the table. You may find the book on my desk. We have a meeting on Thursday. His birthday is on the 2nd of February. I’m on the phone with my mom. The room is on fire. I went to school at 8 a.m.
Meet me at the theater. He laughs at your acting for a reason. I believe in the concept of reincarnation. I wanted to jog in the morning, but in December that’s a challenging thing to do because of the weather. I live in an apartment near campus. They gathered around in a circle. Do you have this dress in blue? In studying, it is always better to read your own notes to jog your memory. Protip: Use “into” if there is motion toward something: I walked into the kitchen. You looked into the matter. When making comparisons between two things that are similar, use the preposition “like,” if followed by an object of the preposition, whether it be a noun, pronoun, or noun phrase. It should not be followed by a subject or verb. In place of “like,” you may use “as if” (as, as though) when comparing a subject and a verb. Correct: You look like your sister. Correct: You look the way your sister does. Incorrect: You look like your sister does. Correct: You look as if you’re disappointed. Incorrect: You look like you’re disappointed. Protip: To know when to use “as,” look for a verb. Though prepositions are used to indicate position, they are not always necessary. Sometimes they only complicate a sentence. There is also the issue of not ending a sentence with a preposition–linguists are torn about this. 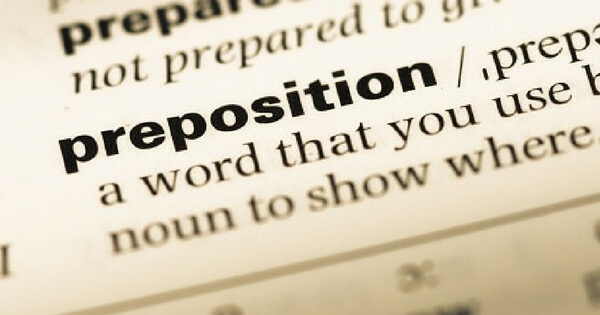 A general rule would be to avoid ending a sentence with a preposition but not if it sacrifices the quality of the sentence. Correct: Where did you buy this? Incorrect: Where did you buy this from? Correct: Where did you go? Incorrect: Where did you go to? Correct: Is he someone I can depend on? Incorrect: Is he someone I can depend? The English language can be confusing because of the many rules and exceptions to those rules. As with many languages, words often sound correct because of the sheer frequency with which they are used, even if they’re wrong. However, that’s not an excuse for getting it wrong. So instead of following everyone and propagating the wrong use of words, guide them into the light.